Time Beacons are installed at regular gap for each patrol route for monitoring purpose. Each patrol guard is assigned with a BLE-enabled phone during his patrol rounds. When the guard scans a Time Beacon, all information containing identity, time, and exact location of the guard is sent to TimeTec Patrol’s cloud portal. Punctuality can be controlled during patrol rounds, whereby everytime a guard clocks late or early at predefined checkpoints, automated notifications will be sent to notify supervisors or the management about the tardiness. TimeTec Patrol App is loaded with useful features for guards to perform patrol tasks, such as reporting of incidents, receiving adhoc tasks, and instant reporting during emergency; and with the app, monitoring of guards’ locations in real-time is made easy. 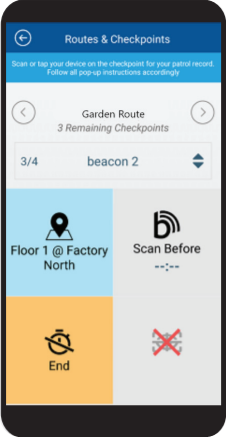 Time Beacon still works in buildings with poor GPS reception because the location data associated with the beacon will be transmitted without delays when the phone returns to a location with good reception. 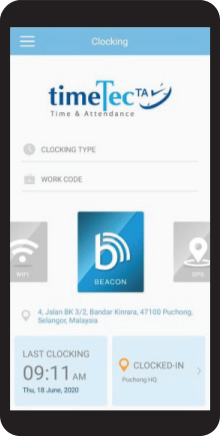 Install Time Beacons at specific locations for staff’s attendance clocking and the staff needs to open TimeTec TA App on their smartphone and scan the nearby beacon to record their attendance. Work codes and/or activity codes can be assigned to label the worked hours on the employee timesheet. Arrivals, departures and break times are recorded by the smartphone on site, and the administrator can access TimeTec TA cloud solution and get the real-time data for further analysis. The deployment of Time Beacon and mobile app in today’s BYOD or Bring Your Own Device environment gets you to save on the hardware cost for time clocking and it brings convenience to both employer and the staff alike.